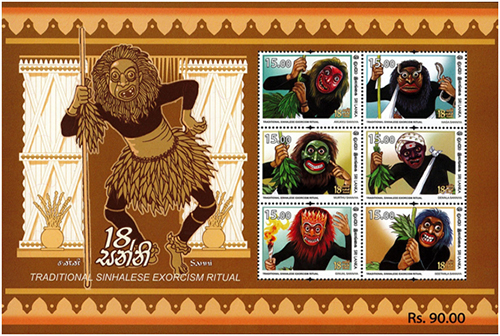 The Philatelic Bureau of the Department of Posts has issued 18 new postage stamps in the denominations of Rs.15.00 and 3 Miniature Sheets on August 08, 2018 depicting the masks and the events of the Daha-ata Sanniya (The Eighteen Diseases). The consort of king Sankhapala of the Licchavi dynasty was named princess Asupala. After the marriage with the princess the king had to go out for a battle with the kingdom of Kuru. Although by that time the queen was pregnant, there was no time for the king to come to know about it. In the mean time the queen had a desire to eat a delicious variety of mango (mi amba) and she told about that to the chief minister. Since it was off season there were no mangoes to be found in the entire city though extensive searches were made. The chief minister who managed to come by a mango which had matured out of season brought it to the queen. At the same time there was a female attendant of the palace who too was pregnant and had the same desire of eating mango. On seeing the queen eating mango she asked for a piece of mango. The queen who was greedy for eating sweet mango ate the entire fruit without giving even its seed to the servant. The female servant who became very angry decided to take revenge on the queen. In the mean time, the king was returning to the palace having won the battle and going forward to welcome the king, the female servant poisoned his mind against the queen telling him that the queen was with child having committed adultery with the chief minister during his absence. The king, having seen the queen’s belly believed the story and ordered that she be executed. Despite the repeated attempts of the queen to prove her innocence, the king called the executioners and ordered them to take her to the cemetery and hang her and cut the body into two halves. The executioners took the queen and having hanged her on a pubberiyatree killed her by cutting her body into two halves with the sword. One half of the body fell at the root of the tree and on account of the meritorious karma of the royal prince in the womb, the other half too fell down and attached to the other thereby giving smooth birth to the prince. The newly born baby who had nothing to feed on, grew feeding on the flesh and blood of the dead mother. As a result of eating human flesh he got a grotesque appearance. The prince, having grown up determined to take revenge on his father for killing the mother, made 18 lumps of poisonous fruits and leaves of the forest and making 18 Sanni demons entered the city of Licchavi and began to destroy it. It is said that the prince became the chief Sanniyaka or Maru Sanniya and the 18 followers took the form of the Daha-ata Sanniya. It is also believed that after the city of Visala was plagued with the three fears, the Ratana Sutta was recited and the demons were expelled thereby making the city free from the three-fold fears. There are three local traditions of the Sanni dancing ritual as Bentara, Matara and Raigama. Although the Raigama school of dancing is similar to that of Bentara school it is performed similar to the Gam Madu ritual in terms of the style of dance, decorated costumes and dialogues used. In the Matara tradition ritualistic performances are done in a style of dance with use of dialogues which are unique to that tradition. Inviting gods Natha, Vishnu, Kataragama and Pattini to the flower bed. The main decoration in a Sanni dance ritual performed around Sanni devils is the Sannividiya or street. It is known by other names too such as Sankhapalavidiya, Sanniyakumvidimalawa, Kapalavidiya etc. In the Matara school it is known as mal maduva or flower shed. There are several verses compiled for Sanni demons who are mainly given offerings in the Sanni dance. In the yagaor ritualistic literature there are two main categories as verse and prose. In the prose category there are invocations, mantras and dialogues and there are many categories of verses also compiled in the four-line metre. These verses composed consisting of three aspects such as the invitation to demons of diseases, dispelling diseases and expelling them are especially created in a manner that includes the stories of the birth of demons of diseases, seeking permission, the diseases caused, the manner of conducting rituals to dispel such diseases, invoking blessing, expelling etc. In the composition of verses in different metres they are composed adhering to poetic features such as alliteration and rhyme. In the Sanni dance the drum beats used in respect of the respective demons are composed in a manner that suits the portrayal of the characters of the respective demons which cause the diseases. The main ritualistic performances relating to Sanni demons in the Sanni dancing commence at midnight and at the beginning the story of the Sanni demons is narrated with the Licchavi dance or Kumara Pelapaliya (procession of princes). In the Mataraschool of dance it is known as the dance of Minister Suvanda Mal (Minister of Fragrant Flowers).Thereafter several processions are conducted to invite Sanni demons to the floor. Here the eighteen Sanni demons are invited and it is the practice at this stage to recite the verses meant for the object of offering and bless the sick man by performing the dance of the relevant offering. In the present days prior dances are performed wearing masks. After the entry of the MaruSanniya as the chief Sanni demon of the eighteen diseases, the Daha-ataSanniya is performed. Depending on the different schools of Sanni dance there are slight variations in the appearance of Sanni demons on the floor. On certain occasions it is possible to observe the use of different names to identify the Sannis. The standard eighteen Sannis considered to be correct are given in the following verse. However , the Kola Sanniya is not a Sanniya that reflects symptoms of diseases belonging to the Daha -ata Sanniya . It symbolizes the incident of the advent of the above demons in the island of Lanka . It appears that the symptoms of diseases caused by Sanni demons can be compared with those of the local Ayurvedic system . Dances are performed using abstract physical movments in a manner that higlights the ill health situations of the relevan Sanniya accompanied with singing , the drum beat and dialogues portraying the nature of the character imitated . vests , trousers , bells and anklets , there are costumes especially designed for Sanni demons .The string of foliage (athu vela ) made using twigs of burulla /gurulla plant obtained from the surrounding environment on the day of the ritual , the waist band prepared out of the piruvataya (piece of cloth ) which is five riyanas long supplied by the dhoby (hene mama ) have been added to the main costmes used in the Sanni dance . In the designing of hair , moustaches , beards ect . worn by performers in the Sanni dancing , very often black , brown and yellow colours were used in the past .Although they were made out of materials obtained from the natural environment such as hana (jute ) , niyanda patta , wetake roots , kitul and coconut fibre etc . in the past , in the present day artificial fibres are used for that purpose . As stage items the athu mitiya (bundle of branches ) and the walking stick are ued extensivey . While a replica of a gun is used for the Vedi Sanniya and a lighted torch (pandama ) for the Ginijal Sanniya , a replica of a cobra is used in the Naga Sanniya . In the Deva Sanniya some use a simple replica of a muruthen kada (pingo of meals for Gods ) , a walking stick and a piruvataya (white cloth ). Coldness of body caused by the disturbance of body wind and bile followed by pain in joints , nightmare , yelling and intermittent crying are the main symptoms of this sickness . In addition to those , it is considered that other symptoms such as body rashes and the insatiable desre to drink king coconut water are unique smptoms of this ailment . This situation affects the mental condition of the sick person . It is caused by the disturbance of physical metabolism owing to unsuitable bodily indulgence , consumption of stale food , suppression of physical needs for excretion , sensual fear , anxiety , anger , sadness etc . According to Madhava Nidhana , the symptoms of Abootha Sanniya are occasional convulsion of the chest , burning sensation , insanity , perspiration and inadquate sleep . This Sanniya is caused by excessive secretion and disturbance of bile in the body . The symptoms include the feeling of the emenation of heat from the body , reddening of eyes , loss of appetite , nausea , bibberish and the distortion of the mouth to the right side . This Sanniya may be caused by the disturbance of bile and phlegm . Pain in the eyes , abscesses in the ears , twisted neck , feeling of heat emanation from the body , difficulty in speech and benumbed limbs are the common symptoms of this Sanniya . In the Vatha Sanniya there are symptoms caused by disturbed body wind such as aimless walking , blood -shot eyes , grinding of teeth , flatulence ,wind -breaking , incoherent talk , loss of appetite and insanity . Occasional insane status caused by fear , talking irrelevant things , fear of being followed by somebody , constant dark vision , loss of appetite and diarrhoea are the symptoms of this disease . Although some identify the name of this Sanniya with Bootha Sanniya , Beetha Sanniya shows signs of being afraid of something . Insane conditon , headache , excessive phlegm and extreme cold are the common symptoms of this disease while deafness is the inevitable result . There is a cobra figure carved in the mask in this Sanniya because Witch Doctors beleive that such reptiles have no ears . Acute sleepiness , urine and excreta block , swelling of body , insanity , burning sensation of the body , irrelevant talk and feverishness are the common symptoms of this disease while acute weekness in eyesight is very common . In Ayurvedic medicine it is considered that this disease is particularly caused by disturbance in the bile . Skin rashes and tumours , burning sensation of the body , back ache , cramp in the calf , loss of sleep , fever , insanity and incoherent talk in an insane status of mind due to disturbed bile are the symptoms . Babbling , constipation , deafness , surfeit , loss of sleepiness in the night , headache and burning sensation inside the body , intermittent feverishness are the main symptoms of Golu Sanniya . The main symptom of this Sanniya is being unconscious from time to time . There are episodes of long durations of unconsciousness of four or five times , internal abscesses in the body , muscle cramps , diseases in the belly and excessive fever . Craziness , madness , gibberish , running here and there , talking in Tamil , furrowing of the forehead and blackening of the face are the symptoms of this disease . In the Gulma Sanniya caused by gulma worm , the elements of food coagulate and with the passage of time it is mixed with blood and forming into an abscess , spreads throughout the body . At the advanced stage of the disease there are symptoms suh as diarrhoea , aversion to food , vomitting , weakening of the body , abscesses in the intestine , lack of blood circulation to the brain etc . Lameness in limbs caused by cramps in the muscles as a result of being a long time in extremely cold water and cerebral inflammation are the main symptoms of this disease .It is also possible to have symptoms of crippled fingers and limbs owing to malevolent effects of black magic associated with spiritualism .Distortion of the mouth is a special feature of the Kora Sanni mask . It is known among Witch -Doctors that symptoms such as burning sensation in the chest , reddening of eyes , nausea , madnes , running helter -skelter and intermittent fever are the most common ones in this disease . In the mask of this Sanniya designs of flames are carved to symbolize agni or fire and it is the practice for the exorcists to come to the floor carrying a torch in the hand . Shivering of body , headache and pain in the limbs , muscular cramps , coldness in the sole , immobility of fingers , weak pulses , vomitting and insanity are the symptoms observed in this disease . This Sanni is also known as Vevulum Sanniya ,Seetha Sanniya and Jala Sanniya . Symptoms in this Sanniya are caused due to the poisoning of the body . The urge to be in shade owing to the burning sensation of the body , reddening of the eyes , diarrhoea , secretion of heat water from the eyes , ears and nose , madness , difficulty in speech and the all over physical appearance of being affected by poison are the common symptoms of this disease . Burning sensation in the body , fast beating of pulses , severe fever , flatulence , indigestion , faintness and the bulging of eyes are the symptoms of this disease . The main symptoms of chicken -pox , measles , mumps etc . which are considered by some as diseases of the gods too are indicated in the dialogues by the dancers . In the small maks used for the Kola Sanniya to indicate the advent of the eighteen Sannis to Sri Lanka (Kadavath tharanaya ) , on both sides of the serpent hood there are two parts of the thiringithala design on the two sides . In the Kana Sanniya , some enter the dancing floor with the pupil of the eye painted in white to indicate blindeness . At the end of the performance , the white patch is wiped off and dialogues are used to indicate that the person is now free from blindness . In the Deva Sanniya , depicting the figure of God there are two fangs curved upwards from the mouth . In the Matara school there are tiny Sanni masks carved in the crown on the head of the mask . In the Ginijal Sanniya there is a special design of flames on the upper part of the head to symblize flames . There are eighteen Sannis on both sides with nine masks on either side . It is the common practice today to use a mask with a thiringithala design and a serpent hood because of the difficulty in wearing it due to its size . It is a specal feature to feature Raja Mulu Kola Sanniya made in the form of a bali figure on both sides of the eighteen Sannis .Although it is numerically referred to as Daha -ata Sanniya , in the present day there are twenty Sannis with Vedi Sanniya in the Matara tradition and Maru Sanniya in the Bentara tradition . 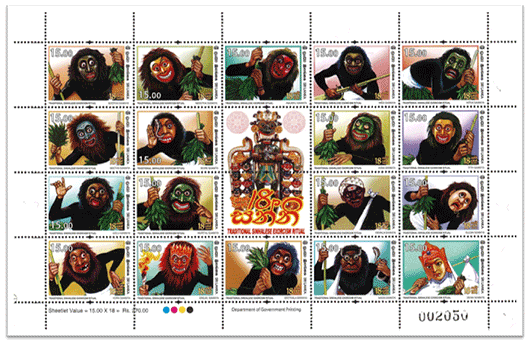 It may be noted that the masks relating to the Sannis depicted in these stamps have been selected in order to portray them in an attractive manner in stamps by taking into considertion the three traditions of Bentara , Matara and Raigama . Amarasekera , Thilakadasa – “ Daha -ata sanni yaga vidhi vimarshanaya” , An author publication , S & S Printers , Colombo 2002 . Kariyawasam , Tissa – “ Daha Ata Sanni yaga vigrahaya” S .Godage & Brothers – Chatura Printers , Wellampitiya - 2001 . The Art of Mask Making in Sri Lanka, The National Trust Sri Lanka, Goonarathne Offset Ltd Colombo.